Mother Nature is spot-on on her regular cycle as she unabashedly announced the official arrival of Summer last week with the first triple-digit heat-searing day of the year during the Summer Solstice. 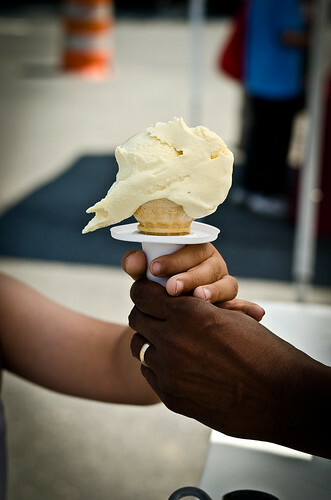 With the sun keeping us indoors or beating us down during our brief scurries from the car to destination point, nothing comes better to mind as relief from the oppressiveness than either taking a dip in the pool or ocean, or having the quintessential heat buster in one hand – ice cream. I chose the latter on that given day. 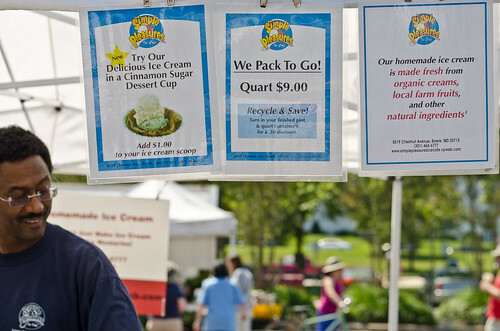 I came across Simple Pleasures while strolling through the Greenbelt Farmers Market some time last year, and I was curious to see a vendor selling ice cream home-made with local organic milk and locally sourced fruits. The owner was very excited in telling me all about his creations including one made with blackberries which were seasonal at that time. Walking around with the cup in my hand, I was baffled by an interesting note, a je-ne-sais-qoui, that trailed at the end of each bite. I scurried back to the owner and he coyly made a guessing game out of my curiosity which left me completely stumped. Eventually, he told me that he had put some lavender essence as the back note – brilliant. That day, I knew I had come across something interesting, creative, delectable, and well-crafted. I had to discover the location of their store. 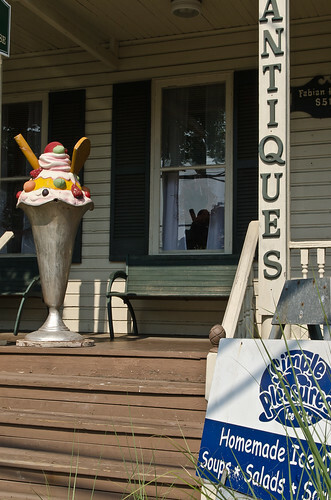 The Simple Pleasure store is located in Old Town Bowie, in between the new part of the city and Laurel. Driving through this rather quaint section, one notices that this charming part has now been a bit forgotten due to its location off the main road and also to the new construction around Bowie, which has made this suburb a home destination for the middle class and the up-and-coming. 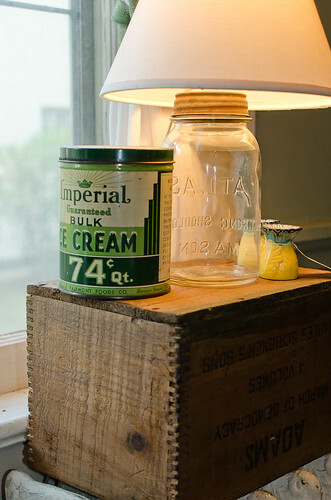 The store is located in a house that appears to date from the early part of the last century, judging by its sprawling verandah and wooden construction, alongside similar looking structures that have become Antique stores. The coffee shop is on the bottom floor past the comfy living room area filled with sofas that beckons the guest to make it home. In the dining section, tables hold small glass vases containing pretty flowers that add a bit of charm to the simple room that is filled with antiques and European pottery, which also fill up the upper level rooms – the owner was stationed in Europe for a few years, and he and his wife want to bring some elegant charm to the ambience. 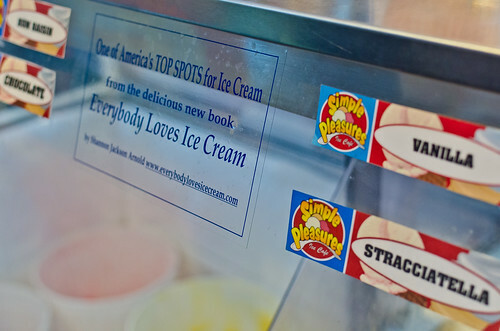 Food orders are usually placed in the back where vats of freshly made ice cream are displayed along with some pastries. Lemon Custard: A pronounced lemon 0il flavor which gives the lemony kick in the cream without the acidity of lemon juice. I’m a big fan of this. 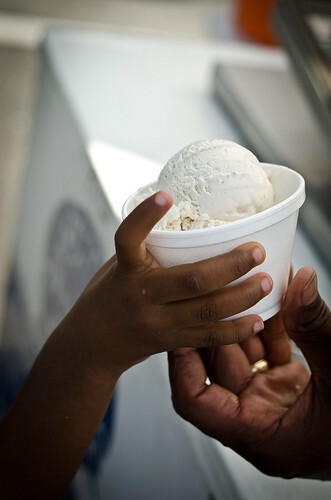 Vanilla: Specks of real quality vanilla seeds in a smooth clean flavored ice-cream. The owner said that some folks are not used to the real thing after having eaten fake vanilla for years. But I prefer true vanilla that gives a slight heady flavor and aroma that match the smooth pure cream. Stracciatella: Ice-cream that has been laced with hazelnut essence and speckled with shards of imported Italian dark chocolate. A taste of Italia and it is just Divino. Rum Raisin: Real boozy without knocking you down, studded with plump rum-soaked raisins. I can’t get enough of this but I have to drive home at some point. Dark Chocolate: This gets as dark as it gets with the use of quality dark chocolate that gives me that satisfactory sweet bitterness from the high cocoa butter content. This is a definite mood enhancer if you need something to perk you up with. Strawberry Rhubarb: This is a classic combination of sweet and slight tartness that I am fond of. The fruitiness of the strawberries still shine though the rich cream. Fruit Sorbets – rich with pure fruitiness without the artificial flavors found in the commercial brands. Not too sweet also. Obviously, everyone has their unique taste for flavors, and these are just samples of the wonderful offerings. 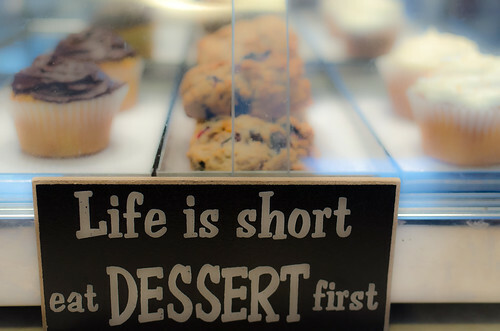 The flavors do change according to seasonal fruits and the creative whim of the owner, like Guinness or Chai – yumm! 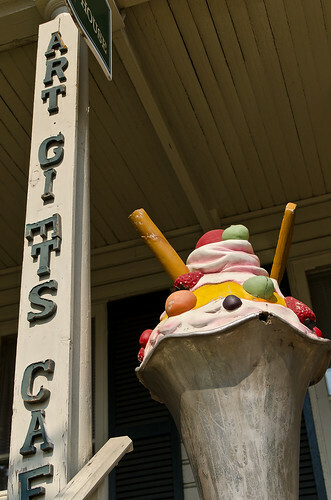 On my visit during the Summer Solstice, I ordered a childhood favorite, Banana Split. 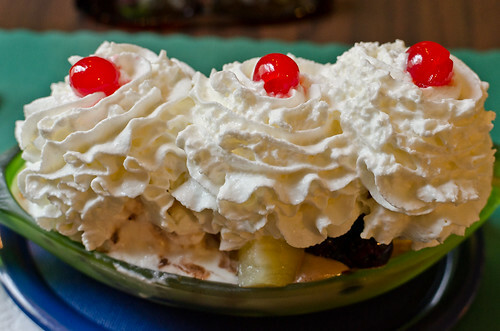 It arrived in a beautiful frosted glass banana boat, filled with some chocolate syrup, a sliced banana, heaps of my ice-cream flavors of choice, topped off with a mountain of whipped cream and peaked by bits of maraschino cherries. 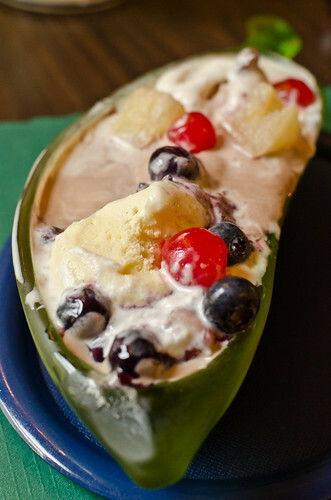 Bits of pineapple and fresh blueberries were interspersed amidst the cornucopia of sweet and rich flavors. After I removed most of the whipped cream, I polished off this monstrosity with no hesitation, and I was amazed that I was able to do it without feeling oversated or guilty. In addition to this ice-cream “meal”, they also offer a bowl of 5 scoops if you are in that kind of mood. Most of us just can’t enough of a good thing. The pastries are made by the daughter who equally likes to try out her creativity with the seasonal ingredients in these baked goods. They are tasty, well-made and appropriately rich. In addition to flatbread pizzas, wraps, and sub sandwiches, they offer Afternoon Tea which includes a cup of properly made tea, served in a teapot on a tea candle, and a serving of pastry or scone – this has been perfect for some cold winters in which I sought relief from the bitter cold with a “cuppa” and a sweet bite. If you want to get a bit more fanciful, they offer two types of High Tea which include finger sandwiches, a cheese tray, fruits, and pastries, along with the hot beverages and ice-cream. However, an order has to be placed 24 hours in advance before showing up; I can never get myself to think so far ahead for this, but I will get my act together one day. The husband-and-wife team are dedicated people who are committed to small businesses around the area and to the community. They are extremely friendly, and you can sense their passion for the fore mentioned when you engage them in conversation. They hold a theme dinner one night of the month and it is usually standing room only – the last dinner’s theme was Mediterranean which I regrettably missed out on. Throughout the week, they haul their ice-cream stand from one farmers market to another in order to serve the various people in the county. 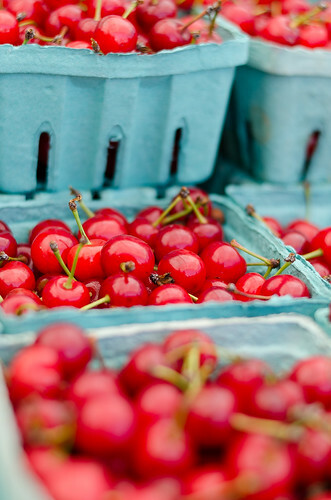 These are passionate, hard-working, and knowledgeable foodies – my kind of people. In an age of corporate chain coffee shops and ice-cream stores that exude indifference and impersonality, Simple Pleasures brings back the charm of knowledgeable owners who are giving you a part of themselves in the product that they serve. Walking into their Bowie store, you get good food and ice-cream, warm smiling faces, and a comfy home-like environment to plop yourself down, away from life’s battles out there. What more can you ask for than just some truly simple pleasures.